I always look forward to this time of the year when fresh vegetables are coming into season. Around here, I visit our local farmer's markets who have the best selection, at the best prices! Plus, I'm supporting my community when I buy local. Today's guest-post recipe is courtesy of Pasta Fits and will yield four 1 1/4 cup servings. I think it would make a great appetizer soup or just enjoy it for lunch with your favorite side-salad. Preheat oven to 350ºF. Slice the garlic heads in half along their equator. Place together in a large piece of foil. Wrap tightly and roast until softened and golden brown, about 30 minutes. While the garlic is cooking, start the soup. Heat a soup pot over medium heat. Add the oil and sauté the onions, carrots, celery and thyme until softened and just starting to brown, about 5 minutes. Add the stock. Taste and adjust seasoning with salt and pepper. When garlic is cool enough to handle, squeeze out the garlic and discard the skins. Stir the garlic into the soup. Add the ditalini and cook until al dente, about 10 minutes. Add the peas and asparagus and cook another 2 minutes or until crisp tender. Divide between 4 bowls and sprinkle with parsley. 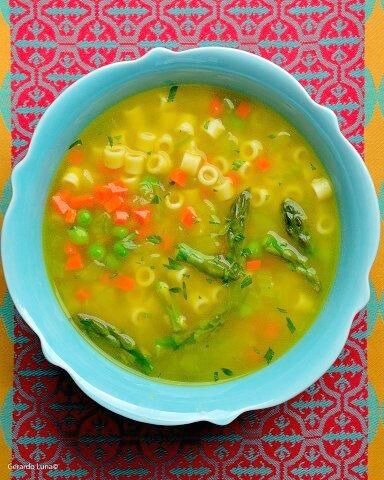 I love the vegetables in this soup. I know that roasting garlic makes it taste sweet and it would combine so well with the other vegetables.